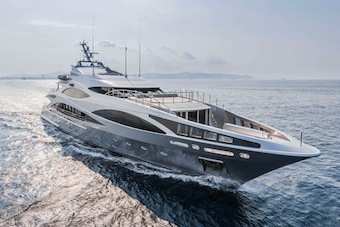 Benetti introduces the new FB502 m/y “Panthera”, the 47-metre aluminium yacht, whose contemporary style is simultaneously sporty and elegant. 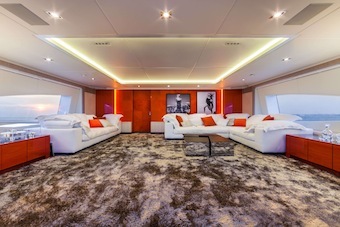 The FB502 M/Y “Panthera” is the second yacht in the 500s series. The first one, FB501 “Imagination”, came on the market in 2010; and the third one, FB503, is scheduled for delivery spring 2014. 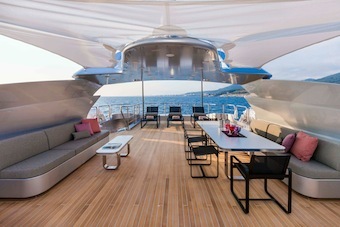 Constructed at Benetti’s Livorno boatyard, the 500-series yachts are 100% aluminium, 47 metres long and 8.8 metres wide. Their hull geometry ensures superior performance (maximum speed 24 knots and cruising speed 22 knots), as well as significant stability while underway; noise and vibrations are almost completely eliminated, for enhanced comfort even at higher speeds. All this makes “Panthera” a fast and comfortable yacht with a style that reflects the refined personality of the boat owner who has commissioned a contemporary yacht featuring timeless elegance. Clean, soaring lines and large tinted oval windows go perfectly with the metallic silver colour of the exterior, silver shades being the dominant colours of the “Panthera”. On the exterior, the teak detailing (traditionally black) is grey; and the interiors have a sophisticated combination of lighter and darker grey tones. 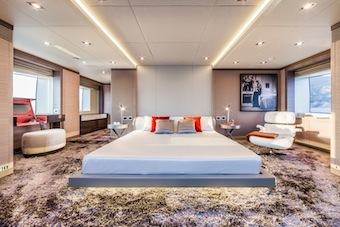 A key feature highlighting the contemporary and carefully thought-out aesthetic of the FB502 is given by the large fashion photos hung throughout the yacht’s main areas; whether in black and white or colour, large or small, framed or unframed, the images portray the magnetic feminine allure of gorgeous international models and actresses, adding even more glamour to this sophisticated yacht.